Review: Here’s something you don’t get every day, a sweetly innocent romance that doesn’t oversell its charm and doesn’t make anyone a villain along the way. Brooklyn was an unexpected delight, anchored by strong performances, a sensitive script adapted from a heartfelt novel, and tender direction that underplays without ever resting on its heels. A wallflower working for a shrewish shop owner in 1950s Ireland, Eilis (a ravishing Saoirse Ronan, How I Live Now) is given the chance for a new life in America when her sister makes arrangements for her to travel to a new country with new opportunities. Her sister stays back to care for their aging mother and invests her dreams with her sister as she sends her on her way. The journey is hard and the adjustment difficult but soon Eilis has created a place and purpose for herself where previously it never existed. Living in an all-female boarding house run by Mrs. Keogh (a splendid Julie Walters, Paddington), Eilis works in a department store and attends Friday night dances put on by the parish that sponsored her trip. Expecting to meet another Irish immigrant, she’s instead romanced by a shy but persistent New York native (Emory Cohen, The Gambler) who courts her in a most old-fashioned way. She meets his family, considers a future with him and then…plans change. 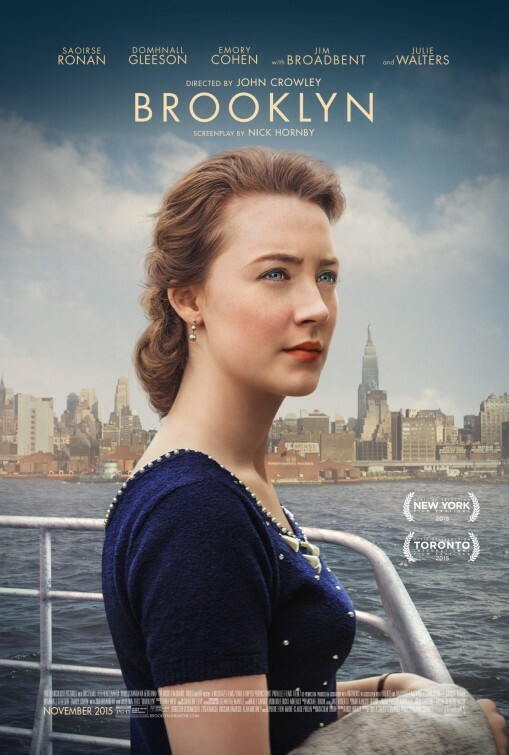 What makes Brooklyn so special is that it presents choices for our leading lady in a time when women didn’t always have a say in what their lives had in store for them. And it goes further than that, making clear that either decision that Eilis contemplates holds promise of a full life. No one is colored as malicious (at least none of the main characters are) and there is no “bad guy” to be found. To introduce that factor would mean that there was a “right” choice to make. As audience members we know what we want her to do, but there’s trust established that lets us know she has her head on straight. Ronan was one of the younger actresses ever to be nominated for an Oscar for her brilliant work in 20074’s Atonement and she’s likely making her way into the Best Actress nominees this year for her beautifully realized performance. Cohen, too, has charm to spare and I found myself smiling at his sincerity as the would-be tough New Yorker expresses his feelings for his Irish lass. Domhnall Gleeson (Star Wars: The Force Awakens) hits the right notes as an Irish suitor for Eilis as does Jim Broadbent (Cloud Atlas) as a priest that provides support for Eilis while in America. More than anything, I wished for Brooklyn to go on longer…I wanted to know more about these people, their lives, their hopes, and their dreams. It wouldn’t be hard to imagine another movie (or TV series…hint hint hint) fashioned around the boarding house run by Julie Walters. There’s rich material there and from the various women we meet during our brief visits there’s more than enough laughs and tears to fuel new story ideas. Directed by John Crowley (Closed Circuit) and adapted by Nick Hornby (Wild) from the novel by Colm Tóibín, Brooklyn is surely one of the best films you’re likely to see in 2015 (or 2016, now that you’re reading this). Make the journey, it’s worth the trip.